In its Historic Series, The British Music Society has reissued, for the first time on CD, McCabe’s piano recordings from 1968 and 1972. The CD includes all the material from McCabe’s recital disc Pastorale, recorded in 1972 and released on LP by Decca, plus two other items. 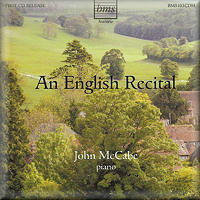 "This year John McCabe celebrates his 70th birthday, and we should celebrate with him his selfless devotion to the promotion of the music of others...The British Music Society...has now issued in timely fashion this immensely valuable and downright enjoyable CD of performances...which still sound excellent, with full piano tone and very silent background...we should welcome the opportunity of acquiring this well-filled CD...A lovely record." “Released in celebration of John McCabe's 70th birthday, this splendid recital is a timely reminder of what we will soon be missing, for McCabe announced earlier this year his intention to retire from the concert platform. The present disc, recorded mostly in 1972, is typical of his enterprising programme-planning, with the familiar and not-so-familiar rubbing shoulders on equal terms.